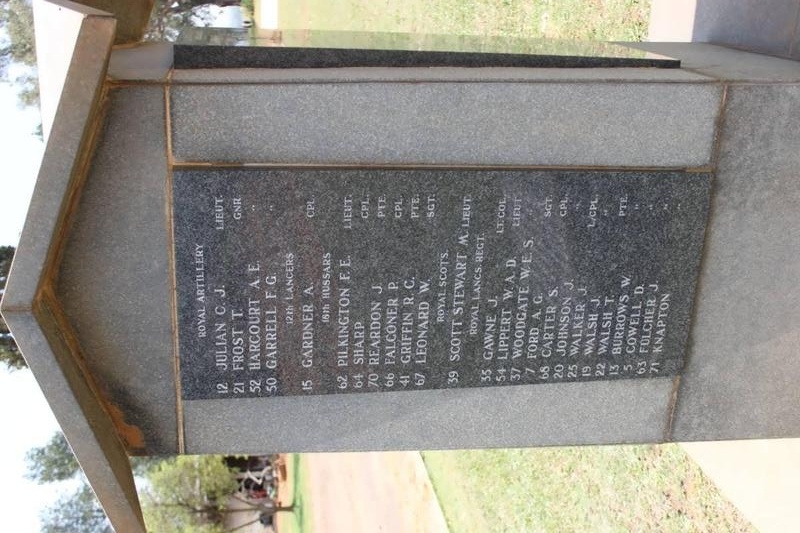 I am just trying to track down any information on an ancestor of mine Albert Edward Harcourt a gunner in the Royal Garrison Artillery, killed in action on 11th December 1900 at Vryheid. I am no expert on the Boer Wars and my interest is purely as an amateur looking for any information, about this man and his regiment. Any photographs or pointers to find out anything further would be gratefully received. I know he appears on a roll of honour on the Leicester Boer War memorial. He was the only death from his unit, two officers were mentioned in dispatches and two men awarded the Distinguished Conduct Medal. It must have been a fierce action. While the SAFF records your ancestor as "25266 Gnr. A.E.Harcourt", a check of my trusty Royal Artillery CD shows his correct number as "22566". In the "Nominal Rolls for the issue of medals of medals to Officers and men", Gnr. A.E.Harcourt is shown as "22566" with his QSA medal and three clasps being issued on 14/10/02. On medal roll WO100/145, the relevant page for his unit (No.2 Coy, WD, RGA) shows "22566 Gnr. A.E.Harcourt" as being entitled to clasps Cape Colony, Transvaal and Laing's Nek. A marginal note confirms Vryheid and Killed in Action, 11/12/00. Thanks for your very comprehensive reply. Much appreciated. Copyright © 2004 - 2019 AngloBoerWar.com. All Rights Reserved.